Buddhism in Ladakh - The Tale of Buddhism! Buddhism in Ladakh is ancient and widespread and a popular theme for cultural tours in Ladakh. The population of Ladakh is predominantly Buddhist and Ladakh has been deeply influenced by Tibetan Buddhism, which follows the Mahayana and Vajrayana schools. In these forms of Buddhism, Buddha is worshipped a deity who has attained Nirvana (freedom from the cycle of birth and death). Various incarnations of Buddha, known as Bodhisattvas, are also worshipped in monasteries. Many tourists undertake trip to Ladakh to explore, understand and learn from the ancient Buddhism which is practiced here. The mythology of Tibetan Buddhism has many tales of various spirits and demons. These representations of both good and evil qualities are depicted in the form of masks and their stories are enacted as masked dances during the annual festivals of various Gompas in Ladakh. Dalai Lama: The Buddhists of Ladakh regard His Holiness the Dalai Lama, as their supreme spiritual leader and as living incarnation of Buddha. The present Dalai Lama, who is the 14 Dalai Lama was originally known as Tenzin Gyatso. As a child he was recognized as an incarnation of the previous Dalai Lama, who had passed away in 1933. Tenzing Gyatso was brought to Lhasa and proclaimed the new spiritual leader of the Tibetan people on Feb 22nd 1940. Due his resistance to the Chinese occupation Tibet, the Dalai Lama became an icon of political as well as spiritual leadership for the Tibetans. The Dalai Lama left Tibet and came to India in March, 1959. Ever since, he has led an international campaign against the Chinese occupation of Tibet. He received the Nobel Prize for Peace in 1989 for his leadership of the struggle for the peaceful liberation of Tibet. Gompas: A Gompa is a spiritual community where monks or nuns live and practice their religion. Gompas in Ladakh are also educational institutions and play a central role in the life and economy of the local community. Gompas are more than just monasteries and many have museums where tourists can view collections of Buddhist art. The annual festivals in Ladakh are celebration at the Gompas which is a colorful sight with masked dances and religious ceremonies drawing both pilgrims and tourists in large numbers. Chortens and Stupas: Chortens and stupas are dome shaped structures built over a square base. They are usually built in memory of a Buddhist monk or religious teacher. Some stupas may contain relics of holy men. Chortens are often decorated with Buddhist prayer flags and offerings such as oil lamps or flowers etc may be placed around them. Thangka: Thangkas are Buddhist religious paintings that depict episodes from the life of Buddha or various Boddhisatvas. Rich in symbolism and Buddhist imagery, Thangkas are religious artifacts and the art of learning to paint a Thangka is a discipline that requires extensive training. Mandala: A Mandala is a symbolic representation of the Universe according to Buddhist iconography. A colorful design made from sand on the floor of a monastery or painted on a wall or screen, a mandala is believed to have mystical powers that aid in meditation concentration and prayer. Mandalas often depict a palace with four gates, which open to the four principal directions of the Earth. Mandalas are used in the rituals of a monks initiation and are called the 'Architecture of Enlightenment' Mandalas made of sand are usually swept away after a prayer ceremony to symbolize the impermanence of life. The designs of the Mandala follow an ancient tradition and consist of concentric circles and intersecting lines. The process of learning to create a Mandala is part of the training of every Tibetan monk. The Central Institute of Buddhist Studies in Ladakh is the premier for the study of Buddhism in Ladakh. 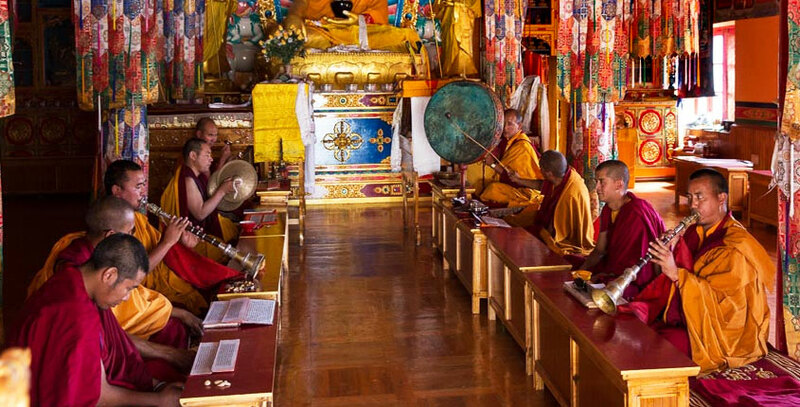 Established in 1959, the institute was created by the combined effort of ten important Gompas of Ladakh. Pandit Jawahar Lal Nehru, India's first Prime Minister, extended the support of the Indian Government to this institute of learning. The Institute currently offers courses from primary education to Doctoral Degrees and has 29 Gompas and nunneries affiliated to it. The Central Institute of Buddhist Studies is located in Choglamsar, about 8 kilometers from Leh.